I’ve got another gigantic post for you today. Go let the dog out, grab yourself a cup of coffee and settle on in. 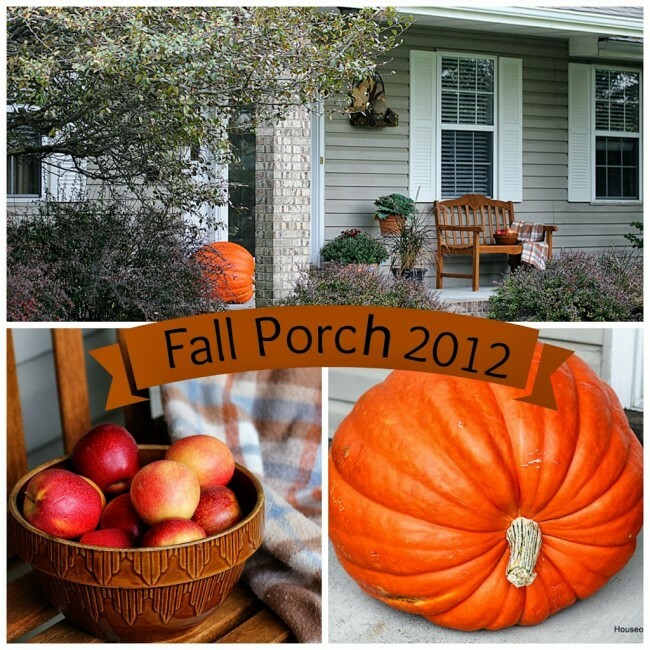 Because it’s my annual fall front porch post, people! No just throwing a mum on the porch and calling it a day. Oh no, if the neighbors aren’t thinking that I’ve gone a tad nutso, then I haven’t done my job. 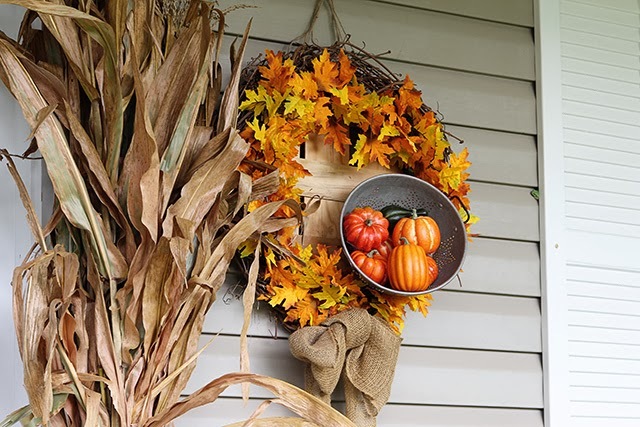 Before I get too far into this fall festiveness – If you are here to see my fall home tour, you can take a peek at it HERE. You are more than welcome to come sit on my porch and have a look around too, of course. First of all, you will notice that my gigantic pumpkin that miraculously appeared in our compost pile this year is NOT on the porch. Still trying to figure out how to get him out of the compost and on display. Anyone have a backhoe? And yes, that is a fern you see on my fall porch. It was still looking so pretty that I couldn’t stand to get rid of it yet. Let’s just pretend I live in the South instead of in Ohio. I put the wreath that I made a few weeks ago on the wall of the porch. We sort of have that empty space just sitting there and it begs to have something fill it up. Besides, it’s so 2012 to actually put your wreath on your door. Last year, I looked for these tall bushel baskets everywhere and I couldn’t beg, borrow or steal one. 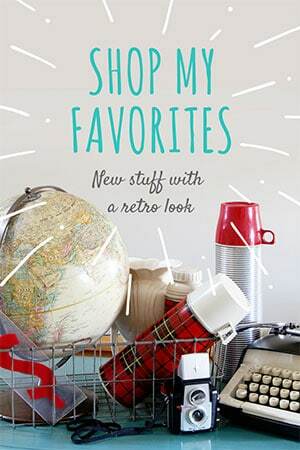 This year I was practically tripping over them at every yard sale I went to. I made the chevron burlap pillow covers from fabric I found at Hobby Lobby. I actually used a sewing machine this time. No iron on Stitch Witchery stuff or staples. A real, honest to goodness, plug in the wall sewing machine! 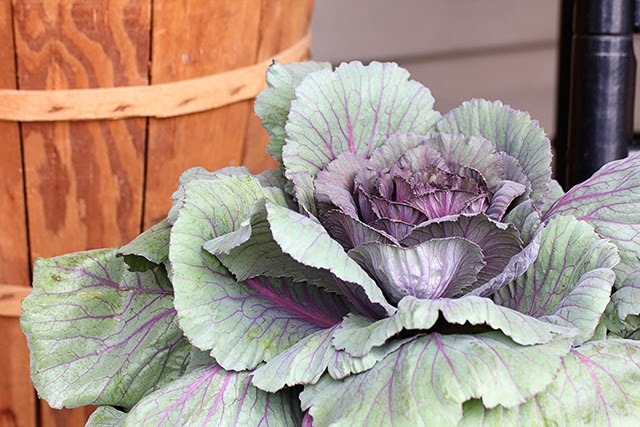 I potted up some cabbage in a rusty bucket that I bought at a barn sale in June. And some kale. I think it’s kale? I’m not good with my veggie identification, but it looks too frilly to be called cabbage. So, that’s the porch in a very big nutshell. 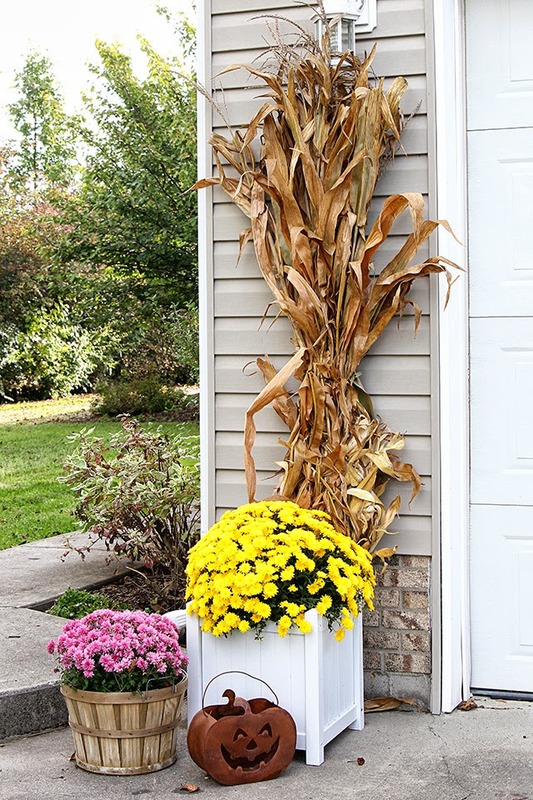 When I came to the garage, I tied it into the porch by using more cornstalks and some mums. 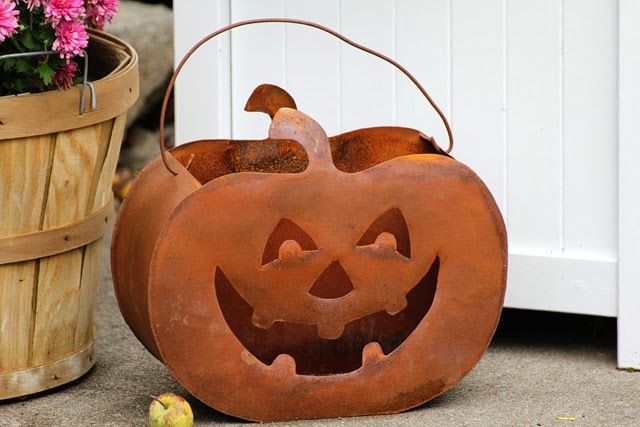 The rusty metal pumpkin rounds out the vignette. See that tiny little apple placed so strategically beside Mr. Happy? It just magically fell out of the tree and rolled over there when I was taking the close up. Sort of a gift from Mother Nature. Gosh, while I’m blathering on about outside decor, I might as well show you the back porch. Yeah, not a lot to see out here. I’ve pretty much just bunched all my plants together by the back door and put away all the furniture and doodads. But you can see this area from the inside of the house, so I like to have a little something something out here. Whew, I’m off to take a nap now! Your corn shocks look great, I might have to get some. Take care! Where did you purchase your black rockers? 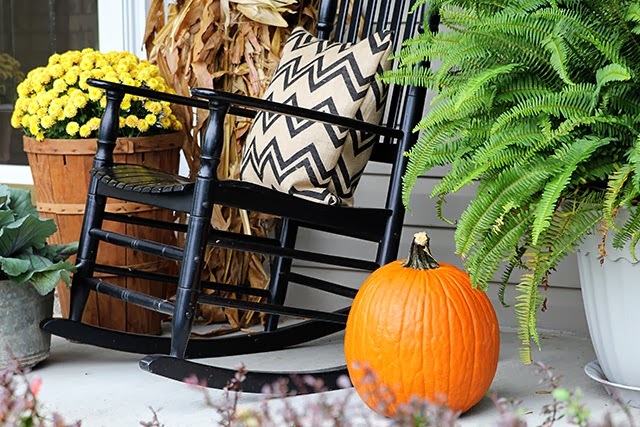 Your porch always looks so great, and this fall version is no exception. I’d love to sit there and drink my coffee. @Anonymous – I bought the rockers at Walmart probably two years ago when they were on clearance at the end of the summer. The have held up really really well and I only paid around $49 for each of them (still a lot of money for something on the porch, but a lot cheaper than other ones I looked at). This is SO pretty, Pam! 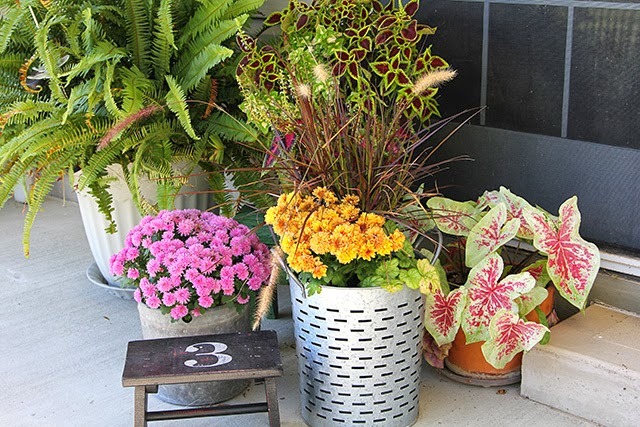 I love the look of the cabbage in the galvanized container especially! 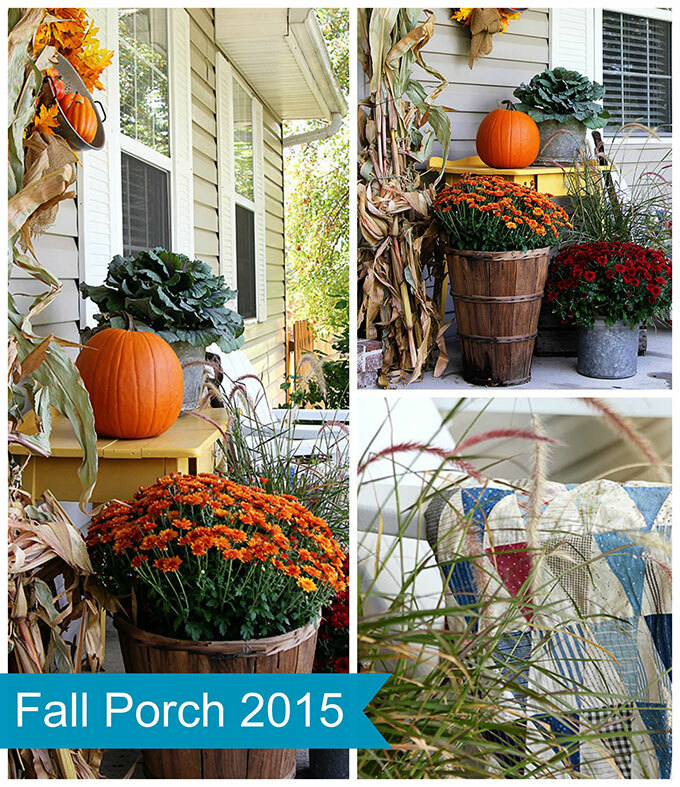 And my front porch fern is so huge this year that it has become part of our fall porch, too…maybe we’ll start a trend lol! I always look forward to your porch posts. I’m going to have to steal your bushel basket idea. I have two in the garage just waiting for something magical to happen. I’m feeling behind. Not a single pumpkin or cornstalk in sight at our house and it’s nearly October! Pam your porch looks fantastic! You really nailed the details. The olive bucket with mum is perfect. Your wreath is gorgeous. I am so glad that I have been following your blog. @Merri Jo – It’s actually a Limelight hydangea, but the blooms left on it this time of year tend to be smaller than normal. You can sort of see that one bloom in the last full porch photo where I talk about “in a nutshell”, but I have no idea why you can’t see it in the photo two below that one. The photos were only taken a few minutes apart. I wonder if it was extra windy at that point. What a lovely and welcoming porch! 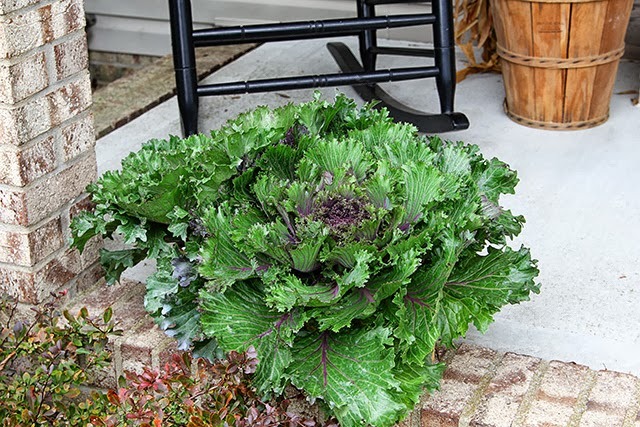 Yes, the plant you mention as being kale, is indeed and Ornamental Kale. Leave it outside and the colder it gets the more color it will have in it. Until, of course it freezes and turns to mush. Wal-Mart for the black rockers! That is great. Have you had to re-paint them since you purchased? That is one of the problems I keep reading about is the paint chipping on the outdoor rockers and not holding up during certain weather conditions. Your porch looks great. I really like that wreath. What doess the plaque say on your house? I enjoyed your home tour as well. @Anonymous I haven’t repainted them. So far no chips either. Last year we put them in the garage in the fall and winter though. The previous year was really mild here so we left them out all year. I think you would just not want them to get really wet a lot, since they are wooden. 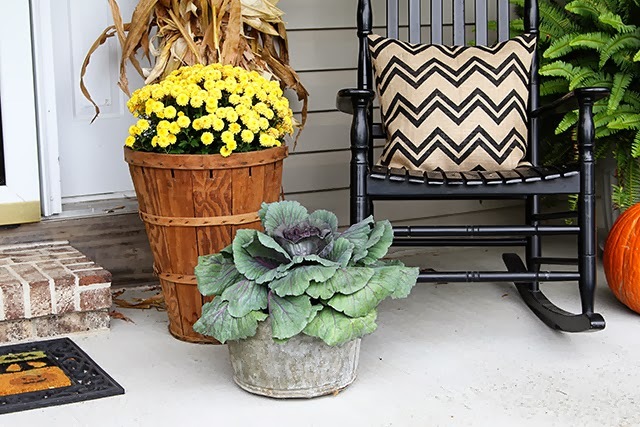 Your porch looks fantastic–you deserve that nap! I think I will take one because I got tired just thinking about decorating the porch! 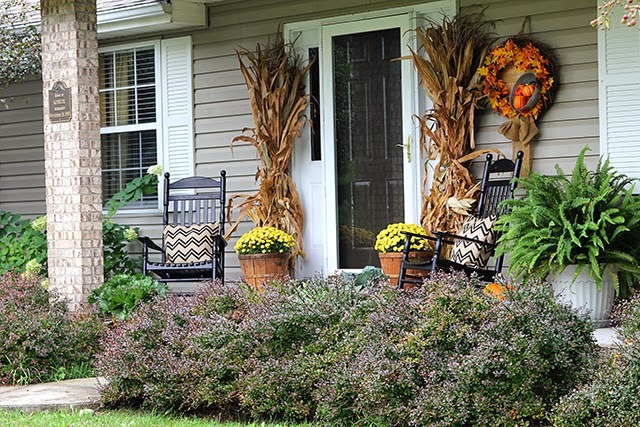 Pam, Your Fall décor is beautiful! What a pretty house and porch. Pam, your porch is all decked out for the season and has plenty of curb appeal, I’d say! I got out today and swept the debris from our birch trees off the steps for my fall spruce up. Does that count? that’s it! I will get my porch furniture repainted and decorated this weekend by hook or crook! I am impressed with the beauty of your porch, looks like a great place for rocking. Pam you’ve done yourself proud again. Your porch looks amazing and oh so pretty and festive for the season. You always make it look so effortless on of these years I am but able to polish up my outdoor decorating skills in an effort to get somewhere close to your talent. Love it all. This is my kind of decorating! Love the chevron fabric pillows- great job and they catch the eye nicely! The corn stalks look great up against the house and yes that is kale. I used some in my display too. The fern looks great- a splash of green keeps it colorful! The colander on the wreath is too cute. Beautiful porch. Love those gorgeous fall colors here. The pillow is great. 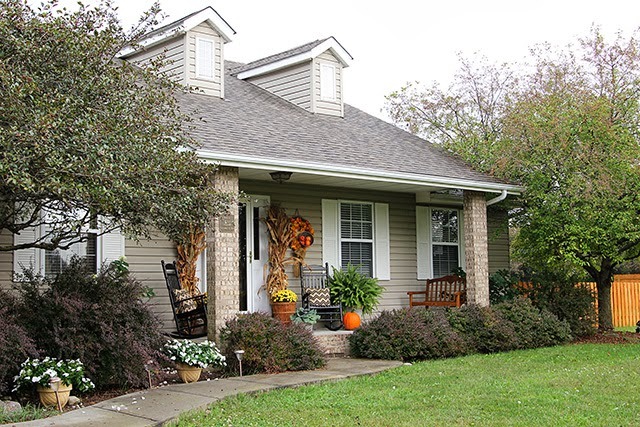 you have such a wonderful home, love the gray siding, it looks so good with all the Fall fun!! Great porch, love the wreath with the colander. So many cute fall elements. Gee, I was feeling pretty good about the decorating I had done outside until I saw your porch! It sure looks great, Pam! LOVE the bushel basket. Your porch looks great! 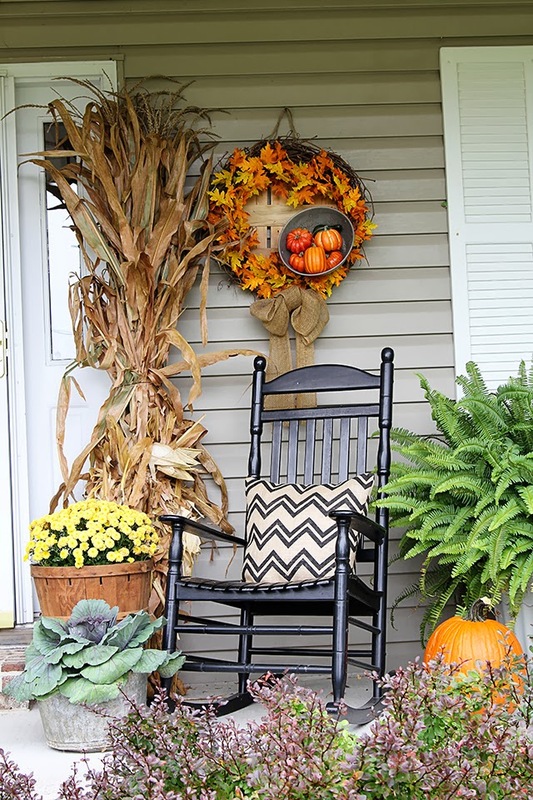 I love the fern with the pumpkins and corn stalks! I don’t usually like chevron but love the color of yours and they look great on the black rockers! You knocked it out of the ball park with your fall decor. Just perfect! I guess I’m stuck in a time warp because I have a fall flat basket hung on my front door. Of course I don’t have a huge gigantic porch like you do! I love all the interesting buckets and baskets you are using. and all the different (correctly identified, ha!) vegetation! It looks great. I love the cornstalks. The cornstalks are “oh so auntum” but you really rocked it when your threw that cabbage and kale out there. 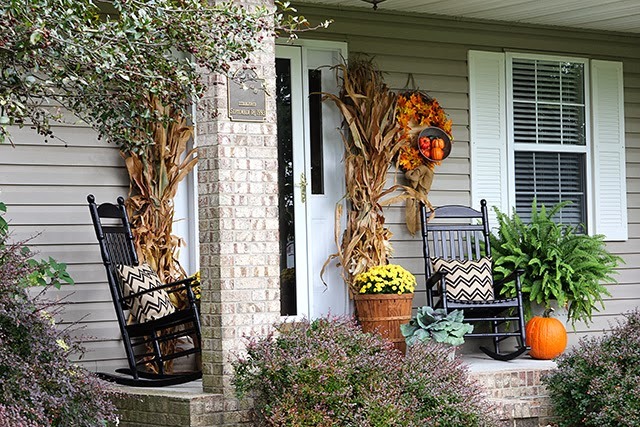 Wonderful Fall Porch!! Your porch decor is beautiful. The kale are stunning. Mine never last very long–the insects strip the leaves off ours every fall. I really love your porch! The wreath is adorable. I wish I could find cornstalks around here. They have a huge impact! I’m on the hunt for cornstalks now! Your porch is so warm and welcoming! I love all your Fall touches! Thanks so much for sharing . . . You inspired me. 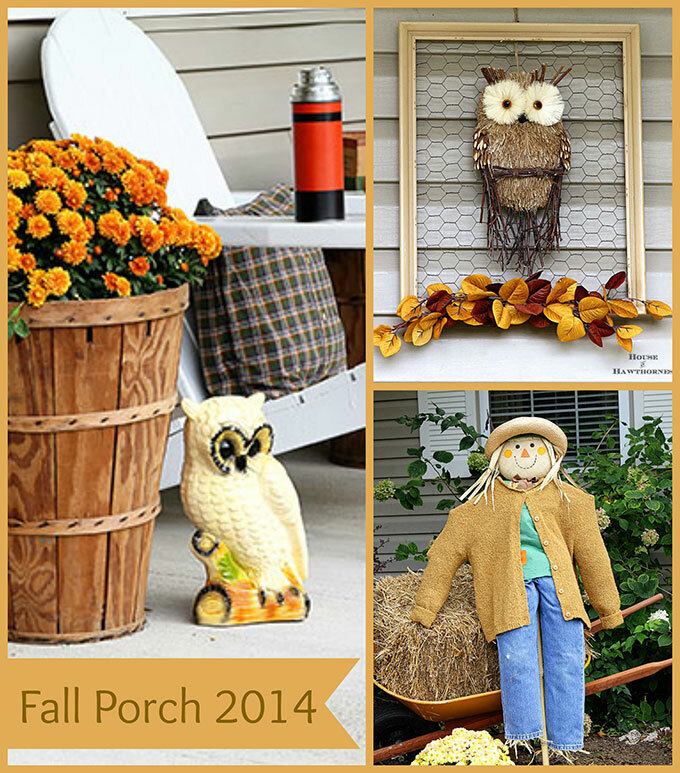 Your 2013 fall porch is gorgeous! I can’t wait to see what you do in 2014. P.S. I’m making a lamp out of a themos today thanks to you! 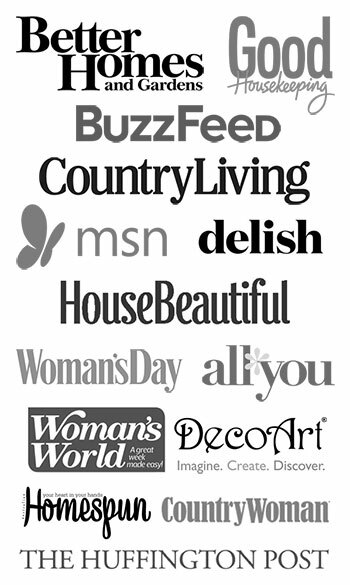 I just found your site on Pinterest. I love your porch colors that you used, but I truely would like to know the color the house is painted. We are looking at a country home with a front porch, but house color is really what caught my eye. Tell me if you can. Love your cute house and porch. It always looks so pretty. Have a great Friday and wonderful week end. Just ran across your site. 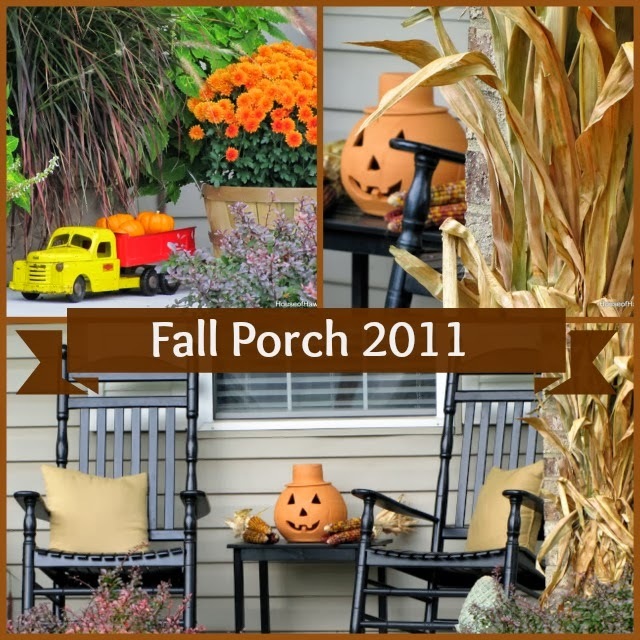 I love your fall porches your decorative style rocks! Thanks you.